In an increasingly environmentally informed society, access to potable water and sustainable supply are fundamental priorities across both the developing and developed world. What often gets overlooked in this mission are the potential pitfalls associated with bodies of stagnant water, invariably a consequence of human reconfiguration of the environment. World Water Week, an ongoing convention being held in Stockholm, is drawing attention to the dangerous underbelly of accumulating monsoon rainfall, poor irrigation systems and festering swamplands. The theme: Water for Development. 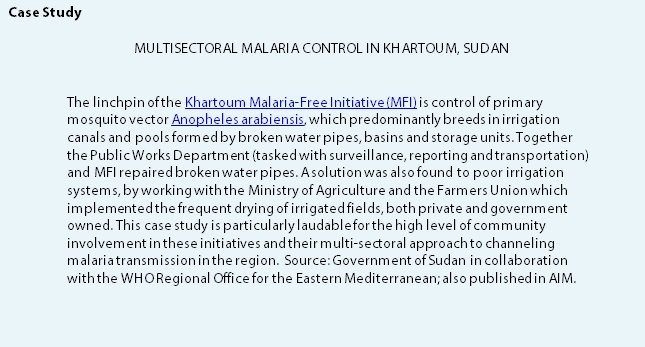 Therefore, Roll Back Malaria’s Action and Investment to Defeat Malaria, 2016-2030 (AIM) publication makes drainage of such reservoirs a priority. As well as decreasing malaria transmission, this activity will improve the general water quality, generating further health benefits. AIM also outlines some key strategies in the control of malaria: early diagnosis and treatment, indoor residual spraying and the use of long-lasting insecticide treated nets. However, these measures alone are not enough. With the rapid spread of developed resistance to commonly used drugs and insecticides, new alternatives need to be included in the offensive picture. Vaccination against malaria is a topical option. By exploiting the genomic sequences of the malaria parasites and vectors, partners GlaxoSmithKline (GSK) and the PATH Malaria Vaccine Initiative recently announced that first stage trials show a statistically significant decrease in malaria diagnosis in neonates and babies who receive an initial administration and booster (at 18 months) of their product. But for all these promising signs, it may be years before an economically and effectively viable programme is rolled out where it is most needed. So our attention and collective efforts must turn to the environments of endemic areas, and assess management solutions of mosquito populations. A systematic review authored by Jennifer Keiser et al. aimed to reduce the burden of malaria in different eco-epidemiological settings with environmental management. They concluded that ‘malaria control programmes that emphasis environmental management are highly effective in reducing morbidity and mortality’. How so? By manipulating the environment, focusing in particular on water-centred solutions, malaria transmission can, to a degree, be artificially managed. Implementations include the systematic elimination of standing bodies of water and the installation, maintenance and cleaning of drainage systems. Of course, such strategies bring associated, and often conflicting, issues. It is hoped that this year’s World Water Week discussions will address toxicity concerns, assess cost-effectiveness, and ease of installation and maintenance. Global health leaders must account for these environmental management methods which create temporary, inhospitable conditions for the vector. So too, they must show an awareness of the further complexity of specific local environmental settings and make-up of said ecosystem. Water bodies associated with rural malaria include: rivers, streams, coastlines, wetlands, swamps and non-agricultural manmade habitats. While the locales are different and require customised measures, the management options available remain largely the same: converting open to closed drains, creating effective irrigation drainage networks following harvest, filling of lagoons, pools and swamps within 3 km of human settlements, and introducing subsoil pipes. Larger scale engineering modifications include reconstruction of river boundaries and extensive overhauls of the infrastructure of canals and manmade waterways. When such measures are considered at the time of construction, there are nominal costs to the healthcare system, which is further proof that such action must be immediate and cross-disciplinary. Comparably, personnel and advocates must be aware that water management cannot work in isolation. Such measures must complement the established practice of household barriers, and empowering education schemes promoting healthy behaviour. Collectively, these actions will promote better sanitation, hygiene and organisation of public services. A limiting factor in this area of research is the absence of reliable data. Without this, it is incredibly difficult to offer a compelling proposition to donors and governments of the benefits such service provision would have to local consumers and to the fight to eliminate malaria. However, the h2.0 Monitoring Services to Inform and Empower Initiative, pioneered by UN-Habitat, is promising change. The initiative tests innovations and enables installation of effective and powerful monitoring systems across the globe. We can all get behind this, by reviewing the outcomes of this World Water Week’s meetings, and supporting h2.0 – for safe water, everywhere. Reducing the Burden of Malaria in Different Eco-Epidemiological settings with Environmental Management: A Systematic Review. Keiser, Jennifer et al., The Lancet Infectious Diseases, Vol. 5, 11, 695-708. Prüss A, Kay D, Fewtrell L, Bartram J. Estimating the burden of disease from water, sanitation, and hygiene at a global level. Environmental Health Perspectives. 2002, Vol. 110, 5, 537-542.